Take now this Ring,' he said; 'for thy labours and thy cares will be heavy, but in all it will support thee and defend thee from weariness. For this is the Ring of Fire, and herewith, maybe, thou shalt rekindle hearts to the valour of old in a world that grows chill. I desired dragons with a profound desire. Of course, I in my timid body did not wish to have them in the neighborhood, intruding into my relatively safe world, in which it was, for instance, possible to read stories in peace of mind, free from fear. But the world that contained even the imagination of Faihir was richer and more beautiful, at whatever cost of peril. "I will take the Ring", he said, "though I do not know the way." Then hope unlooked-for came so suddenly to Eomer's heart, and with it the bite of care and fear renewed, that he said no more, but turned and went swiftly from the hall. All your words are but to say: you are a woman, and your part is in the house. But... I can ride and wield blade, and I do not fear either pain or death. The whole thing is quite hopeless, so it's no good worrying about tomorrow. It probably won't come. His face was sad and stern because of the doom that was laid on him, and yet hope dwelt ever in the depths of his heart, from which mirth would arise at times like a spring from a rock. It matters little who is the enemy, if we cannot beat off his attack. 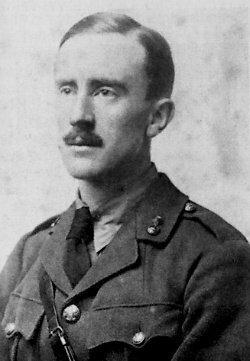 Bio: John Ronald Reuel Tolkien was an English writer, poet, philologist, and university professor who is best known as the author of the classic high-fantasy works The Hobbit, The Lord of the Rings, and The Silmarillion.